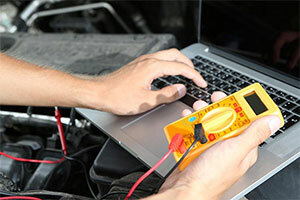 In San Diego, there’s one top choice for professional auto electrical service and diagnosis. Since 2011, Mode Automotive has performed reliable auto electrical service in CA on a wide range of models. Our staff won’t rest until you’re completely satisfied with your customer service and repair results. There’s no need to go anywhere else for your auto electrical service. Mode Automotive will perform any diagnosis and auto electrical repairs your vehicle may need. Our technicians are ASE-Certified with years of experience tracing and repairing electrical problems of all sorts. Whether your Plymouth needs a window motor replacement, your Pontiac requires a starter repair, or your Acura needs a headlight electrical issue diagnosed, your vehicle is in good hands with us. For trusted auto electrical service in San Diego and San Diego County, visit Mode Automotive. Call us today or use our convenient online form to book your visit.